I've mentioned Christian Patterson on this site several times, from the time I discovered his work serendipitously through a link from another photographer's site early this year, and then encountered more of it through the PDN 30, and then came to find out that he plays a significant role with the Eggleston Trust, including developing William Eggleston's ace website. As I've plugged along with my own journal here, Christian always came across as one of the most accessible photographers, and we had exchanged emails a few times. I approached him recently about doing an informal interview, not necessarily with the intention of putting him on a pedestal as the "next hot artist", but more with the idea of having a conversation with a fellow photographer about his particularly interesting emerging career, and talking a bit about the process of photography. But make no mistake: Christian has talent to burn and is indeed worth watching. The latest worthwhile showcase for his work online can be seen in ak47.tv's sixth issue, and he has an exhibition at the Power House Gallery in Memphis scheduled for the summer of 2005. He's a 32 year old Memphis based photographer with a growing pedigree, and has managed to achieve a great deal without (yet) having to endure the rituals of many aspiring commercial and fine art photographers, such as endless mailers of art cards (that end up in the trash bins of agencies), lavish expenditures on portfolio books, and gallery rejections galore. 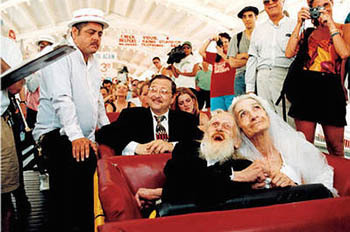 He works as hard and as passionately as anyone, but likes to let his striking vernacular color work mostly speak for itself, and Elena Goodinson at Hotshoe Magazine had a particularly apt description of the appeal of his best images: "...a celebration of our ambiguous place in time captured within a poet's eye". COINCIDENCES: Maybe we could start by talking about how you got started photographing seriously. CHRISTIAN PATTERSON: I consider the time of my relocation from New York to Memphis as the start of my "serious" photography. I moved to Memphis in the spring of 2002. COINCIDENCES: And what made you relocate to Memphis, if you don't mind talking about that? 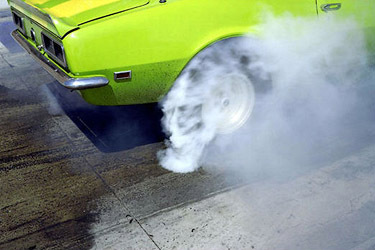 CHRISTIAN PATTERSON: I discovered Eggleston's work while living in New York. I felt a strong emotional connection with his work. It was his personal vision. The attitude and style of his work was a clear representation of what I was striving for in my own photography, in terms of approach and feeling. I decided to fly to Memphis. I called the office of the Eggleston Artistic Trust and spoke with Bill's son, Winston, who is the business director. Winston invited me to visit the Trust and see more of the work there. After the call, I met Winston and Bill at a gallery opening in New York, as well. I stayed in touch with the Egglestons and visited Memphis a few more times. The Trust needed assistance archiving and organizing the work, and I was eager to gain exposure to his work. I made the decision to move to Memphis. That is one thing I've learned: Never be afraid to talk with someone. It's a small world, people are intrinsically good, and things usually work out well. 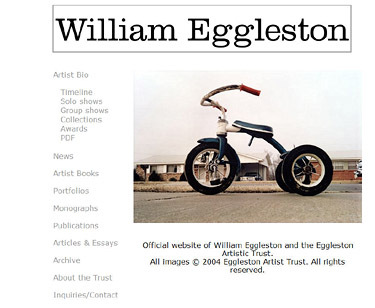 COINCIDENCES: I've mentioned the Eggleston website on my blog, and it's one of the most impressive results of your relationship with the Eggleston Trust. Can you talk more about how the website evolved, and what other types of responsibilities you may have had? CHRISTIAN PATTERSON: I had worked as a project manager with a web design firm in New York. I learned HTML, and designed and built my own photography website. I quickly realized how effective a website can be for forcing you to edit your work, allowing you to share your work, receive feedback, and make connections with interesting people with shared interests. I suggested the website to the Egglestons. It's an opportunity for us to provide all of the usual information--artist bio, lists of shows, etc.--and, in the case of a prolific, legendary artist like Eggleston, provide access to information and work that simply couldn't be found anywhere else. I've tried to do things with the Eggleston Trust site that were revealing, informative, and fun. Perhaps most importantly, there are image samples from some extremely rare artist books and portfolios. I've also posted everything from his high school yearbook portrait to the first examples of published work to video footage of him playing the Hammond organ in our office. We're very happy with the site, and we've received very positive feedback from people who have visited the site. But my main responsibilities at the Trust relate to the organization and archiving of Eggleston's work. Negatives, prints, editioning of prints,etc. I also prepare images for media use, and work on one-off promotional items. COINCIDENCES:Can you talk a little bit about your personal background? You mentioned you were a musician in the past? CHRISTIAN PATTERSON: My father is a musician, a guitar player. I grew up watching him play in the bars. I've always had a creative outlet in my life. During my teens and twenties, it was music. I played in a couple of bands in New York. But I decided to devote myself to photography after moving to Memphis. COINCIDENCES: Mind if I ask what kind of music you were playing? Do you still play from time to time? CHRISTIAN PATTERSON: I played in a guitar rock band. The music incorporated a lot of loud guitars and feedback. I could only describe it as loud, swirling music. (Pause). With melody. CHRISTIAN PATTERSON: I do still play guitar. I just purchased a vintage guitar yesterday. And I do think about starting another band. I do miss playing. But photography comes first. COINCIDENCES: How has your own photography evolved within the context of the work you’re doing for the Egglestons? What role has Eggleston played as a mentor? 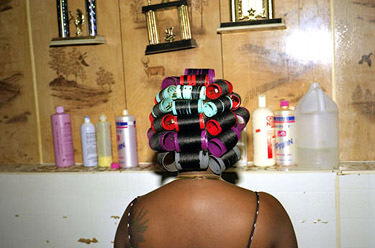 CHRISTIAN PATTERSON: I wouldn’t say that my photography has evolved within the work I do with the Egglestons. But I have learned a lot. I now have a much greater understanding of the span of one's creative career versus commercial success. I've also learned about the business aspects of being a photographer, from an editorial/commercial and a fine art perspective. Working with Eggleston has definitely been a highlight. We've never had a mentoring relationship. He's not my teacher, he's my friend. We talk about photography. He's been very praiseful and highly supportive of my work...we also talk about Memphis, music, and barbecue. I've learned more about photography from looking at things, following my instinct, and just doing what I love. My work is very organic, in the sense that I have no formal art education or training. I've learned by doing, by looking, by experimenting, and by having an open mind. So my work comes from a very personal place. I think the most important thing I've learned is that it's about your own experiences, who you are, and therefore your attitude, style, and vision, and just doing what feels right. COINCIDENCES: I know I first came across your work through several sources, with your recognition as one of the PDN 30 in 2004 being particularly prominent. CHRISTIAN PATTERSON: Being recognized in the 2004 PDN30 was nice. It was funny to see myself listed with photographers following the traditional path, getting their master's degrees, living in the big city, etc. I'm really looking forward to my solo show at Power House, here in Memphis, in Summer 2005. It's a great space, and its curator Peter Fleissig is bringing world-class artists to Memphis. They had shows by Eggleston, Paul Graham, and Mitch Epstein last year. There are only four shows a year, and so far it's Janet Cardiff, George Condo, and myself. It will be fun to share some of my Memphis work with the people who live here. COINCIDENCES: Can you elaborate a little on that point you made earlier about your understanding of “the span of one’s creative career vs commercial success”? CHRISTIAN PATTERSON: I started shooting for myself. And I continue to shoot for myself. I can't explain it. It's a compulsion. An obsession. My first priority is to shoot. I'm grateful for the opportunity to work with Eggleston. It's a great environment. A generous arrangement. I'm allowed to spend time working on my own stuff. I'm given encouragement. I'm given vacation time to travel and shoot. I've been very lucky; I haven't actively pursued most of the opportunities that have come to me. I don't have a working print portfolio. My website, the few editorial assignments I've accepted, and the few shows I've participated in, have all provided great exposure. COINCIDENCES: Given that you didn't follow the "traditional" path of many photographers (as you mentioned, school, portfolios, etc), how did PDN find you? You just mentioned a few things, and you of course have the passion, which is critical...but many photographers out there have passion and connections. 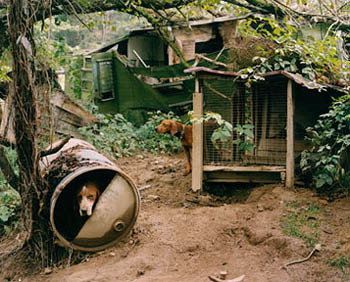 CHRISTIAN PATTERSON: I was referred to PDN by my friend Jason Fulford. 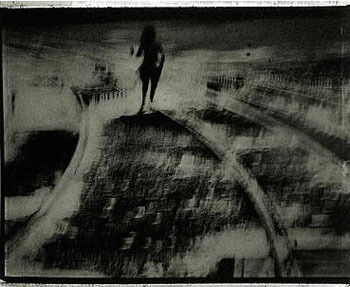 He's a great photographer, and he was included in the first "PDN30". COINCIDENCES: Yes, I know of Jason...he is a very good photographer. In fact, he's self-published some books, hasn't he? CHRISTIAN PATTERSON: Yes, that is Jason. My ultimate aspiration is to continue to shoot, and develop a self-sustaining career as an artist. I've spent the past three years developing as a photographer, and developing my own attitude and sense of style. COINCIDENCES: Well, you're certainly doing a great job...to be exhibiting in the same space that's shown folks like Paul Graham and Mitch Epstein, I'd say you're doing pretty well. We talked a little bit (and I've mentioned on my site) how many galleries tend to look for work that is project-based, or relies heavily on a "theme" or "series". Can you talk about how you feel about the way galleries tend to evaluate photographers' work, and how you've been received so far? CHRISTIAN PATTERSON: Well I can talk about my feelings with regard to working around a theme or project. But I can't talk much about the way that galleries evaluate work, or how I've been received, because I haven't sent my work to any galleries! COINCIDENCES: Ah, then that's OK. :-) But have you gotten any advice from friends, or seen any of your colleagues go through the process? CHRISTIAN PATTERSON: Not really. This may sound idealistic, or even naive, but I truly believe that the work is what is most important. There is no doubt that it can be advantageous to have an art education, to know the right people, and to have a well-written statement. But what is most important to me is the work. We all need to push everything else aside, and ask ourselves, "Does this work move me?". I appreciate and enjoy a great deal of work that I see that is based around an obvious theme or project idea. There are many, many examples. This seems to be a photographic tradition. On the other hand, It seems that the public has come to expect work to be presented to them in this fashion, or that the work needs a context or an explanation. And that is a disappointment. And it seems that some galleries, for marketing purposes and financially-motivated reasons, may be more interested in showing twenty photographs of sock monkeys instead of twenty great photographs of completely different things that share a common feeling or emotion. COINCIDENCES: I can see what you mean on that point...in fact, to provide an extreme example, I just discovered someone who did that type of work -- not sock monkeys, but a series with melting popsicles in every photograph. To be fair, the artist I'm referring to was really more of a conceptual artist who happened to be using photographs...which may be a whole different discussion. CHRISTIAN PATTERSON: Yes. I don't want to shoot popsicles for a living. And I don't want to be remembered for shooting popsicles. It has nothing to do with who I am. I am not completely opposed to shooting a group of photographs as a pre-meditated project. But I have yet to identify a project that I am passionate about, that I feel a strong personal connection with, and that says something about me. I need that personal connection. A theme or a project idea does not necessarily make for great work…I prefer to shoot the work first, as it hits me, and as it moves me, and establish the connections later. COINCIDENCES: Apart from Eggleston, are there are other artists whose work you enjoy or actively look at than you can mention? CHRISTIAN PATTERSON: Yes, there are other artists that I enjoy. 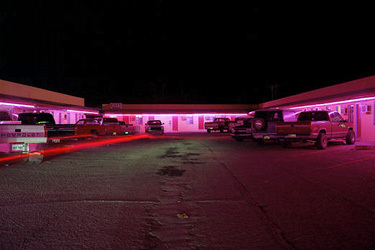 Ed Ruscha, Lee Friedlander, Stephen Shore, Joel Sternfeld...and many others. I also enjoy the films of David Lynch and Wim Wenders. COINCIDENCES: Great names...all my favorites too, seriously. For a while, it seemed like all I looked at were photographs by either Shore or Eggleston. Following up on that point, one observation that's been made by a few people in the photoblog world is that many contemporary commercial photographers seem to be very heavily influenced by Bill Eggleston... in fact, some feel the imitation or "homage" is getting to be a bit much. Do you have an opinion on this? CHRISTIAN PATTERSON: There is no doubt that Eggleston is more popular and influential than ever before. Popular culture seems to rediscover things on a twenty-year cycle. Bill shot a lot of his biggest images in the 1970s, in color. So I'm not surprised that he seems to be so popular right now. 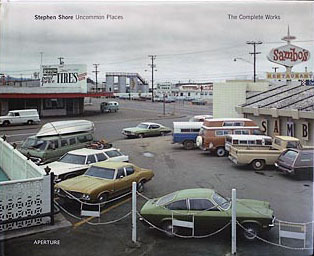 One thing that really amazes me about his work, and the work of Stephen Shore, among others, is the amount of thought and foresight that went into their work. CHRISTIAN PATTERSON: Like many photographers, I started with 35mm. I then saved up my money and bought a Hasselblad. The Hasselblad was a great camera for my transition to medium format. It's such a beautiful but basic design. It gives you the opportunity to learn the basic elements of making a photograph. And the square format makes you look at everything differently. But my main camera for the past few years has been a Fuji 6x9. I love this camera. It's so nice to have a 6x9 that you can take anywhere. I also just purchased a 4x5, but I haven't begun to use it yet. I work within a hybrid process. I shoot film. And I shoot it on medium format. But I only get my film processed, and not printed. I scan each individual frame that I shoot. I do this for two reasons: To save money on printing so I can shoot more film, and to force myself to closely inspect what I am doing, frame by frame. This lends itself well to the learning process, and the refinement of my approach. I do print my work, when there is a shot that I want to print. COINCIDENCES: I considered investing in a 6x9 myself, though I ended up making the jump to 8x10, and it seems like you're going to get started with large format. What spurred your interest in something that's clearly more deliberate than the "smaller" formats? CHRISTIAN PATTERSON: I decided to travel more this year. I had been living and shooting in Memphis for two years. It was an opportunity to diversify my work, and to prove to myself and to others that I can shoot and let my personality permeate other places. I went out West, up into the Great Plains, and down into Florida. A lot of my shooting is a product of driving and exploring by car. During these trips, I found myself shooting a lot of landscapes and scenes that incorporated architectural elements. I wasn’t getting the amount of perspective control that made an image feel natural. So I decided to look into a large format camera. I like to work with equipment that is very transparent. I'm a photographer, but I don't want to look at a photograph and spend more time thinking about the camera than the work itself. COINCIDENCES: Well, you have your work cut out for you with large format...it's not very transparent. :-) But seriously, I have no doubt you'll master it fairly easily. CHRISTIAN PATTERSON: Well I know that there is more involved in producing an image with one of these cameras. What I mean by "transparent" is that the camera is not a strong presence in the final image, and the final image is rendered in a way that feels very natural or similar to what is seen with the human eye. COINCIDENCES: I see what you mean about transparency that way, and that's a good goal to strive for. Though one of the attractions of large format, especially as practiced by folks like Shore and Sternfeld, is that there is something "studied" and hyperreal about the results -- at least to me, what's attractive about their best images is how natural *and* how unnatural they look. CHRISTIAN PATTERSON: Yes, the New York Times described Shore's work as "looking at the world…stoned" or something to that effect. It's a fitting description of the different kind of sensibility that you find in this type of work. CHRISTIAN PATTERSON: Oh, there are so many stories about Bill out there already. Some of them are true, some of them are not. They all add to the mystique that surrounds him and his work. I honestly try to maintain a healthy degree of separation between his work and everything else about him. COINCIDENCES: Well, I wasn't referring to the exaggerated, larger than life stuff about Bill...more about working with the man on a day to day basis. Even something mundane like, did you learn about the best barbecue from him after you moved to Memphis? Or do you guys have different tastes? CHRISTIAN PATTERSON: We like to go to TOPS barbecue on Summer Avenue in Memphis. It's a cool little building that has been there since the 1950s, I think. Kind of like a little drive-in spot. It has a giant brick smokestack with a smiling pig lined in red neon. We both order our barbecue "hot and dark, chopped fine". Extra well-done and crunchy, extra spicy. It's also nice to have Bill in the office, playing his music. We have an old Hammond organ with a giant Leslie speaker, and he'll sit down and rattle off some Bach, or one of his own compositions. He's a great player. COINCIDENCES: That's great. Regarding your work, the things that jump out are the roadside architecture and the color, both of which are very striking in your images. CHRISTIAN PATTERSON: I love traveling, and traveling by car. I'm a bit of a car junkie. It's just so nice to have the world flying by with the windows rolled down and the music turned up loud. It seems like this has, over the years, transcended its position as an average American ritual, and become a photographer's rite of passage. COINCIDENCES: Do you have any good stories about shooting on the road, or have you ever encountered any issues when shooting in the places you do? You've certainly captured some colorful locations. CHRISTIAN PATTERSON: There is nothing like sitting in the car, watching a three-sided, real life, true story pass by. And things get really exciting when that special something catches your eye. COINCIDENCES: Could you elaborate on your approach to color? CHRISTIAN PATTERSON: I just love color. I live in color. I dream in color. The Land of Oz is in color, and I think there’s a reason... I can’t say that I’m attracted to any particular colors. I just like big, bright, punchy colors that seem to say, “Hey!” or make me think “Wow!” And this seems to communicate/translate well with other people. COINCIDENCES: What kind of films do you tend to favor? I know you end up doing a lot of work on the computer after processing, but I was just curious. CHRISTIAN PATTERSON: I use Fuji Reala. This film has great color and saturation. The reds are especially wild. COINCIDENCES: I also like your shots of people (specifically the Midtowners series). How much do you enjoy shooting people? CHRISTIAN PATTERSON: It's interesting to hear that. I don't know, I think I'm slowly becoming more comfortable with the idea of shooting people. The "Midtowners" portraits are just pictures of friends who live in Midtown Memphis. It's been something to do during the colder winter months. COINCIDENCES: Regarding the people, I think it's your sense of color. The vertical shot of the woman in the green chair, the shot of the redhead in the record store, the guy with the big goofy glasses...it all fits very well with your sensibility. They may be just shots of your friends, but they certainly stand out compared to the cookie cutter commercial portraits out there. I hope you find more people to photograph as you continue to drive around. CHRISTIAN PATTERSON: Yeah, all of the Midtowners are being shot in their living spaces. Some of the people are friends, some of them are people that I see at rock shows and after-parties. It's been a good experiment/experience. A chance to interact with the people involved. An opportunity to see how much I enjoy shooting in this type of situation. I do think you've made a point there...those pictures do seem to fit in with the other stuff that I do. Which is saying something. COINCIDENCES: It sounds like lots of good things are ahead of you. When is the Powerhouse exhibition scheduled for again? CHRISTIAN PATTERSON: Summer 2005. Probably May or June. My thanks again to Christian for our conversation, and people with additional questions are welcome to comment here or email him directly (info AT christianpatterson DOT com). I haven't been able to post as much as I'd like lately, but I've never stopped looking at photographs and photo books, and always figured I'd get around to a discussion of my favorite photobooks this year. A month ago, I was feeling that it really wasn't as good a year as the last couple of years in terms of truly landmark monographs -- books like A Storybook Life or What Remains or Family Business which, apart from the understated beauty of their images and the assured quality of their reproduction, have an elliptical yet seductive and epic sense of narrative that rewards repeated viewings. 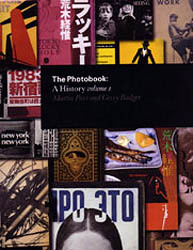 It's easy to pick up many photography books these days and be wowed by a number of dazzling images, but the best photobooks have an almost organic quality to them -- even the most physically imposing coffee table tomes seem to float in one's hands when blessed with the magic of a photographic master with a story to tell. But though photography books continue to grow in popularity, they don't exactly represent an industry like music or film where products get cranked out and hyped for the annual holiday rush...much of the best work is developed over many years of photographing, after a significant amount of judicious editing and reflection. So one year may not yield as much in terms of true classics at first blush, but then again, maybe I'm being unfair and not giving time its due -- the best ones this year may prove themselves to be classics with more time and distance. In the meantime, I enjoyed a lot of reissues and a few recently released labors of love, like Alec Soth's Sleeping By the Mississippi, and Lee Friedlander's Sticks and Stones: Architectural America. The standout reissues were those of several '80s landmarks: Stephen Shore's Uncommon Places, Joel Sternfeld's American Prospects, and Bruce Davidson's Subway, all reprinted more lavishly and with new material, along with thoughtful retrospective essays. The work of the trio of Soth, Shore and Sternfeld, along with more modest but enjoyable monographs like Mike Smith's You're Not From Around Here and Brian Rose's The Lost Border, all reflect a deliberate but poetically abstract sense of place, and a subtle and sophisticated use of color and composition to document transitions and (in the case of Soth) dreams and dreamers. All these photographers use large format cameras (with the exception of Smith, who uses 6x7 medium format) to achieve what Shore calls a "conscious casualness", which gives their photographs their unsettlingly studied quality and enables them (even 20+ years later in the case of Shore and Sternfeld) to transcend time and nostalgia and still speak for the curious quality of American places and life. It was certainly instructive for me, as I learned to look through the ground glass of an 8x10 this year and work more extensively in color, to view the work of these five photographers, and Shore and Sternfeld are cited consistently (along with Eggleston) as major influences on the current generation of contemporary commercial and fine art photographers. 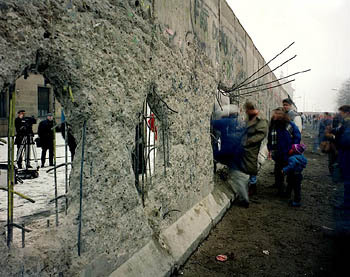 In the case of Rose, his obsessive yet distanced (by necessity) documentation of the Iron Curtain, moving chronologically toward the fall of the Berlin Wall and the reconstruction of Berlin, is the most time bound of these monographs, but again the use of perspective, color, light and distance move the images beyond their documentary function into a meditation on the impact of borders and the communities that exist around them, and the banal face of repression. His book is a nice success story, given his difficulties in getting his project published for a number of years; his photographs gain much more resonance in their reproduction and in their presentation in book form than they did (to my eye) on the web, though his efforts to keep the project going on the web while seeking a publisher were well-intentioned and appreciated by many. In general, the photography book is the ideal medium to view all these photographers, certainly more than the web and arguably even more than the gallery -- large format might dictate that their work would really resonate at billboard sizes in cavernous gallery spaces, but apart from a few images, the work gains the most from the sequencing and quiet but jewel-like presentation of detail on the printed page. (Soth's work, in particular, actually seemed too big in galleries when I first saw it earlier in the year -- his compositions and color sense are elegant enough to make the images sparkle even on the web). The work of Stephen Shore and Mike Smith positively falls on its face on the web, and while the photographs are still rather subtle on the printed page (Smith takes pains to note that he uses the least saturated of color films and quiet light to provide his take on Appalachia), there's definitely a sophistication in the employment of color and space that jumps to life when presented in book form. As a side note, it's fascinating to see how people are documented in most of these monographs -- they're captured almost abstractly, as an extension of their surroundings, as another element in the meditation on place that many of these photographers deliver. When I first encountered Shore and Sternfeld's work, I assumed it was just the nature of large format photography that resulted in such curious portraits, but a photographer like William Eggleston with a small format camera represents people very similarly in his images, which reinforces the point that these are not really portraits, but pictures of people in an environment. (The exception here is Soth, given that his exploration of the Mississippi is a "dream trip" as Patricia Hampl implies in her introductory essay, and the individuals Soth photographs represent dreamers -- even with these dreamers, there is detachment in the lighting and framing, though the distance is never extreme and the viewer is permitted a quiet and gentle affection for the subjects). * Sticks and Stones: Architectural America -- This might be the most challenging of all the books I've mentioned here. Lee Friedlander's crazy, vernacular look at American places and architecture from the vantage point of numerous chainlink fences, telephone poles, and car windows. Superficially, there's a lot of rhyming going on in the images that splash across each two page layout, but there's sophistication beyond the ostensibly common elements in the way these wide angle black and white shots are composed that requires (and rewards) concentration. The distorted verticals, hard light, and weird framing are uniquely Friedlander and can make for some difficult viewing at first, but it's clear he has the same affection for American places that Shore and Sternfeld and all the other photographers do, but a more wickedly crooked way of depicting them that's far from sloppy. * Ed Ruscha and Photography, which approaches the same questions about photography and place that the above mentioned color photographers do, with equal intelligence but a different sense of artfulness (or is it "lack" of artfulness) and a unique wit. Despite being a volume accompanying a museum exhibition (and loaded with a fair amount of text), it's incredible fun to go through and read (I hauled it around to many a coffee shop as easily as I would a trashy paperback), because of Ruscha's sense of humor and the interesting arc of his career with photographs. 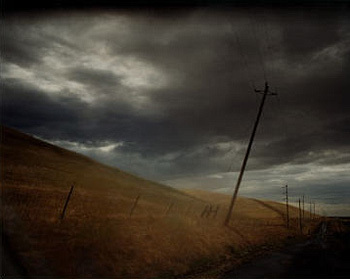 * Todd Hido's lyrical Roaming, a collection of photographs taken across various barren landscapes, often through a car windshield in inclement weather. It's beautifully sequenced and is a bit more romantic than his previous work. The plastic camera crowd should love the grungy, dreamy quality of these photographs. * Fashioning Fiction in Photography, a flawed but nevertheless entertaining and necessary starting look at the connections between narrative strategies in fashion photography and art photography. * Evidence, a reissue of the groundbreaking collection of found "documentary" photographs assembled by Larry Sultan and Mike Mandel in 1977, whose odd and evasive internal logic proved to be a forerunner for many of the postmodern conceptual photography projects of the following decades. Quite a few people would consider this a bad, bad thing, but what's impressive about this reissue (which came out last year) is how elegant its murky and mysterious commentary on contemporary society is, compared to the glut of clumsier and more overtly political and conceptual projects that followed it. The grand prize this year, though, and a book I've just started to really dig into, is Martin Parr and Gerry Badger's The Photobook: A History, Volume I, a huge attempt at a comprehensive telling of the story of photography through the history of the photobook. The enjoyable Book of 101 Books, which was released two years ago, establishes a fundamental canon of books released in the 20th century; Parr and Badger's book goes back to the beginnings of photography, and focuses less on historically influential individuals and more on photobooks that are successful in following their theme with "intention, logic, continuity, climax, sense and perfection" (a set of standards they quote from Lincoln Kerstein). In Parr and Badger's survey, this means that photographers like Ansel Adams and Edward Weston are not represented at all, while folks like Friedlander and Eikoe Hosoe are represented by more than one entry because of their unique facility with the photobook medium. The entries for all the photobooks that are included are thoughtfully written, and the reproductions of pages from them are crisp (and in the case of some of the rarer ones, revelatory). Even in my early wade through this ambitious volume, one thing I can truly appreciate is how it attempts to go beyond "the usual European-American axis" (in Parr's words), and is generous to Japanese photographers in particular. My own list here is highly US and Euro-centric because there hasn't been as much Japanese photography covered and represented in the references that I've encountered since I started developing an addiction to photography books. I've made modest attempts to learn more and go beyond the usual channels, and of course I dote on the few Japanese photographers that get significant play in the Western press (Daido Moriyama, Naoya Hatakeyama, Shomei Tomatsu, Miwa Yanagi, Rinko Kawauchi, etc). And thankfully, the very active blogging community plays a big part here, too, most notably Stacy Oborn's extensive and lyrical ruminations on Japanese photographers (one of my favorite pickups this year, thanks to something Stacy wrote, was Seiichi Furuya's "Christine Furuya Gossler: Memoires, 1978-1985", all 544 odd pages of it), and many other intelligent bloggers, such as Ferdinand's Japanphoto. I'm going to have to find a well-stocked library to start appreciating all these riches that Parr, other critics, and other bloggers are alerting me to, or else I'm going to run out of money very, very quickly. * Sarah Moon has always been one of my favorite photographers, but she hasn't been terribly well represented on the web to date, apart from a few gallery images scattered here and there. This despite the fact that her moody, abstract style is almost tailor-made for the lively subculture of photographers obsessed with dream-like images achieved through motion blur, alternative processes, creative digital manipulations, and the hazy lenses of toy cameras. From a technical standpoint, Moon achieves most of her monochrome magic with a Polaroid pack camera, 665 film, and various creative effects (distressed negatives, solarization), working with a rather dark and subdued sepia palette (which she's referred to as the "tone of memory"). But she transcends the efforts of so many others who go down this road with a vibrantly quirky, dreamy sensibility that seems to draw equivalent amounts of playfulness and darkness from old fairy tales (some of Moon's best images from earlier in her career came with photographs used with a dark version of Little Red Riding Hood, which was recently reissued). Moon is also the rare photographer who has produced artful fashion imagery that manages to bypass prevailing notions of glamor, and works consistently with the rest of her fine art work. Moon has a new exhibition at the Howard Greenberg Gallery (click on current exhibitions) to showcase her latest portfolio of 35 prints and commemorate the release of her short film, Circus, based on Hans Christian Andersen's "The Little Match Girl". (According to the press release, some of Moon's color fashion work will be shown as well). As usual, the gallery has an outstanding Flash slide show of 34 of the images from the show, and it maintains the whimsical, elliptical mood of her previous images, though the captions in the slide show imply that there may be a slightly more explicit narrative that anchors the images. More images from "Circus" and more about Sarah Moon (including an earlier exhibition) can be seen at the Kyoto Museum of Contemporary Art website. Four more images at this French site, and earlier sepia fashion work at Staley Wise. * The fatal flaw with a few contemporary fashion photographers I've encountered recently is a derivative and uninspired decadence with the fashion work, and an equally uninspired sentimentality with the fine art work, which is frequently (and alarmingly) photojournalistic work done in trendy regions like New Delhi, Kabul and St. Petersburg...as if time in such regions would wash away the sins of the fashion work. Long time fashion and documentary French photographer Francoise Huguier achieves a much healthier balance, and while the fashion work on her website is hit and miss, the documentary work is artful, whether it's in black and white or color. 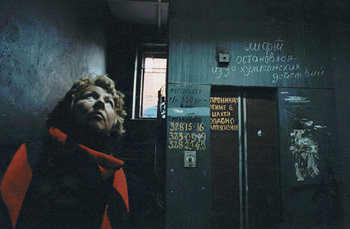 The abstract and moody portraits from Africa are masterful, and while there's been plenty of grimy and memorable work from St. Petersburg, Huguier's work in that region stands quite well alongside other photographers' work (though the images are small). She also has a very unique and worthwhile take on nudes, as well. * It's always a pleasure when a photographer looks interesting in a short glimpse, as Colby Katz did when I first encountered a small set of images in In Magazine (which seems to have gone under, like so many other interesting independent magazines)...and then rewards that early interest with a more extensive portfolio. I posted about Katz and a few other photographers earlier this year, and just recently came across her website, which features her unsettling and interestingly stylized color documentary photography. Some of it (without any text or context) is almost too in-your-face, and I tend to be partial to the slightly quieter (but no less unsettling) projects, like "Rabbit Hunting" and "Seniors". * I've been meaning to plug File Magazine for a while, a fresh online magazine featuring interesting series and projects from a variety of photographers outside the commercial and even mainstream fine art axis. Lots of good stuff to check out, and even better, fellow photoblogger Joerg Colberg's Screen Series (always a favorite of mine among his work) and Stan Banos' witty and observant Pet Cemetery series have been featured recently. (Another favorite, from someone I encountered early in online photography forums: Jeff Alu's rich digital black and white work). * Finally, the latest issue of one of my favorite magazines, SHOTS, is out, and the theme is "Children". Russell Joslin has put together another outstanding compilation of many photographers' submissions, and in the shameless self-promotion category, I'm happy and very flattered to have gotten one of my own photographs published (go to the third page of images) in Issue 86. There is a very good interview with Joslin, discussing the evolution of his own work and his role in editing SHOTS that is worth reading -- check it out here.